After disrupting the telecom space in the country, Reliance Jio is now eyeing the feature phone market in India. Feature phone handsets in the country have so far been restricted to 2G/3G capabilities, with barely a few Indian brands offering 4G handsets. However, the Tier II and Tier III cities, where the penetration of the feature mobile is highest, too are making the switch to more data-laden services. Jio plans to introduce the new 4G feature phone as early as this month as some reports claim the phone will be announced on July 21 during the Reliance Annual General Meeting or latest by next month. There have been many leaks surrounding the Jio phone. However, the actual name of the feature phone continues to be a mystery. Reliance will most likely announce the Jio 4G phone under its already existing LYF brand, which offers 4G smartphones at a budget price. Whether Reliance will introduce a new series (LYF already has Earth, Water, Wind, and Flame) or announce it under one of the existing sub-brands is unknown. The phone will be sold in India exclusively through Reliance Jio and Reliance Retail stores, as well as the Reliance Jio online store. The feature phone was initially expected to arrive with a price tag close to Rs 1,000. However, the most recent reports have halved the initially rumored price, and suggested the feature phone will instead be priced at just Rs 500. Testing on the new feature phone is said to be complete at Reliance ‘s manufacturing facilities spread over the country. The phone will come in the typical candy-bar design and in terms of looks, resembles every other feature phone. Image leaks have shown the feature phone in black color variant with the dual-language physical keyboard right below the small display on top. In terms of specifications, clearly, the device does not have a lot to offer as it is a feature phone. The Reliance Jio feature phone will come with a 2.4-inch display. They keypad will come with the standard menu buttons on top, with what looks to be a USB or Torch dedicated button right in the center. Below the menu buttons, comes the numeric keypad. Reliance has equipped the phone with a dual language keypad, hinting at multiple language support for the feature phone. The phone comes encased in a plastic body design. Connectivity options include video calling (via VGA front camera), GPS, Bluetooth 4.1. On the rear is the single camera lens with the speakers. 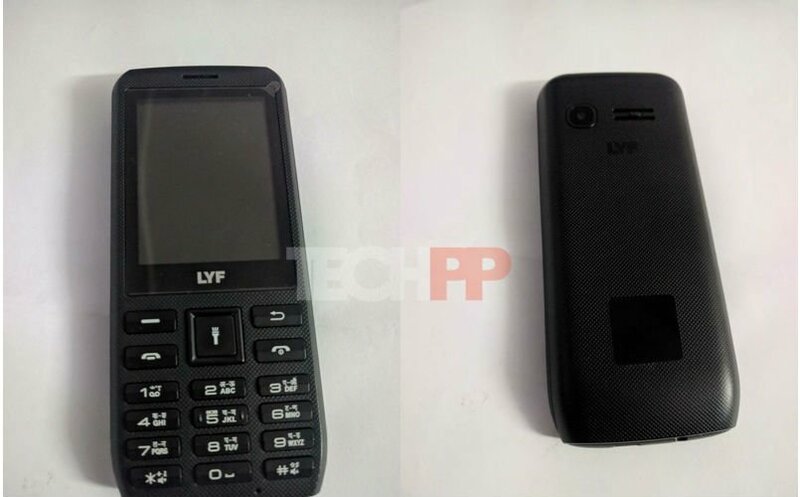 The Jio LYF feature phone is expected to come with 512MB RAM and 4GB internal storage. The processor details remain unknown. The phone is most likely to be a dual-SIM feature phone. The feature phone will come with built-in Jio-specific apps. A report by TechPP also claimed that the phone will support a voice assistant. The Jio feature phone is expected to be based on Firefox KAI OS and the marketplace called KaiOS Plus. Apart from Jio apps, the phone will also come with support for WhatsApp and Facebook.